This is Samsung's top of the line for 2012, the 60 inch UN60ES8000. Lots of new features abound and include a cool new remote which includes a QWERTY keyboard and (so far) Google's new TV search function. 3D viewing is awesome with a smooth, vibrant picture void of any problems from past years - no flicker from the glasses, no crosstalk, no blurring etc. All that is very important for a TV of this price point and the top tier model. It's also got that very cool styling and super thin screen depth. We wish Samsung could inlude more than 1 or 2 pair of the active shutter 3D glasses. 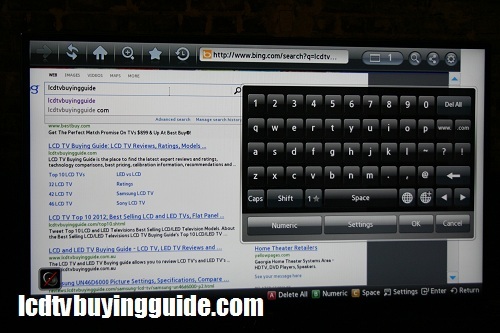 Samsung has been working hard on their Smart Hub Smart TV offering for 2012 with more Apps and full search. Brightness on the UN60ES8000 LED backlit LCD TV is extreme and so is contrast. We absolutely love the contrast and black level. Watch out for washing out your colors with too much Brightness. Keep this setting set to moderate. The UN60ES8000 includes Samsung's new Micro Dimming Ultimate Panel Package which is a feature to describe edge lit local dimming. This new technology, through edge lit and not full array LED backlighting, creates a finer more detailed picture by brightening areas of the screen with light. The effects are incredible and noteworthy and create a more colorful 3 dimensional image even from 2D programming. Making normal HD 2D programming look more 3-dimensional is what it's all about. The micro dimming works by separating the picture into hundreds of parts and pieces and changing the amount of backlighting from the LEDs. Ultimately, the micro dimming helps a couple of key areas including side angle viewing quality and screen uniformity - both issues of past of top Samsung LED TVs. Colors are plenty bright but are somewhat muted from time to time - depending on content. That's better than blown out over-saturated unnatural color any day. Certainly with 1080p broadcast programming they will be super vivid. This is a great time to test our calibration settings for this model or its predecessor (either should work). You will see a marked improvement in realism with these color calibrations. The LED lighting in this top end LED-LCD is edge lit as opposed to the higher end but much more difficult full-array local dimming. Nevertheless, background light in scene images from the sun or other sources present an excellent contrast in the UN60ES8000 due to the great light throughput caused by the LED backlighting combined with Samsung's newer LCD panel overlays. This is also assisted by the exceptional clear coat screen in the ES8000. One of the side benefits of this is incredible picture quality in older 480p type signals (standard definition TV or DVD). In some scenes you would think you were watching a 720p high definition signal. Keep the backlight at a moderate setting of no more than 75% to prevent screen uniformity issues. Samsung's UND8000 series from last year included some of the highest contrast ratio levels we experienced. Depending on the sensitivity of the light meter, contrast for this TV will be at the very top range due to the very high brightness and peak white performance. We measure peak brightness from a quick review at CES, the UN60ES8000 has just as strong a performance. In torch mode (peak brightness) whites measure over 100 footlamberts. 3D Viewing Quality has improved drastically on this years and last years Samsung offerings. Samsung uses active shutter glasses in it's 3D offerings and continues to espouse that technology. 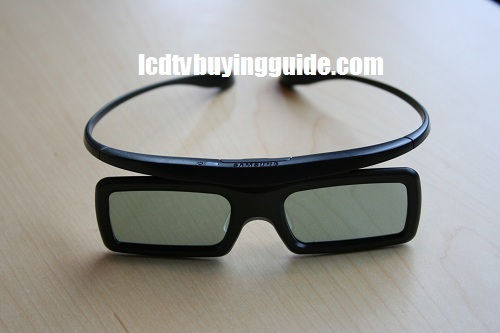 Samsung has one of the widest arrays of 3D glasses available with the introduction of the (SSG-3300GR) model 3D glasses. The new 3D glasses are light and comfortable. Whether you are a fan of 3D or not, you certainly have the option of top performance in that area with the 60ES8000. This feature which we had almost written off in prior years surprised us on the upside in the D8000 series. It's a viable option for viewing your 2D content now and will certainly immerse you in the picture more. It's controllable via the small 3D button on the remote. One press of this button gives you the option to convert the material to 3D. The striking appearance of the Samsung UN60ES8000 is emphasized by the "window" effect with a .2" bezel frame design which increases visible screen area without increasing the size of the overall TV dimensions. The depth is around .5" to 1.25" depending on you measure as well - so super slim. These features are similar to the successful D8000 from 2012. The color of the barely noticeable frame is silver chrome. The accompanying metal stand with this TV is U-shaped and is matte finish on the tops while the edges are a shiny chrome. It will stand out as a modern design in any case and is designed to complement the TV. This is one of the most unusual features to come out in the TV industry in years. Useful? We'll have to wait and get a lot of feedback. Perhaps the greatest and somewhat unbelievable feature on this TV is the facial recognition and voice and hand control in the ES8000. Maybe "control" is not the best word. It might be better to say "suggestion." But you can certainly turn the TV on just by saying, "Hi TV." That much we have seen in person. When the Smart Interaction feature is turned on, waving your hand in front of the ES8000 while it's running will prompt it to display menu control choices near the bottom of the screen. The tab choices are transparent and small at the bottom of the screen so it does not interfere too much with the content you are watching on-screen. Controlling the on screen pointer with your hand motion, going to the control option you want, then closing your hand will tell the TV to open that option. The facial recognition feature of the smart interaction equation allows the television to know which settings to set the TV to when you arrive to watch it and turn it on. This feature we have not had the chance to test or see in action. See that little bulge atop the TV? All this is enabled by the small built in front facing camera located there. Interesting feature? Certainly. Useful? Jury's out. Comment on our Facebook plugin below. With an entire new set of services, Samsung's Smart TVs allow the family a rich variety of options for their home viewing pleasure. Not only can families enjoy their TV shows and Blu-Ray movies, but they can view personal photos, organize their to-do lists, and manage their exercise regimens - all through the TV. There's no worry of this innovative technology fading into obscurity, either; with a Smart Evolution feature, the TV uploads the newest features each year through a kit. You may find Samsung's free proprietary Apps unappealing, but there are many useful paid options. 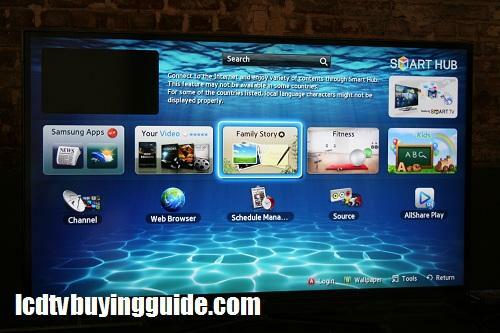 Samsung was the first to offer an HDTV app store similar to the ones you find on today's smartphones. There is plenty of free content like YouTube, Pandora, streaming media and social media content and there is also premium content that varies in price but is for the most part cheap. The Apps selection on the 60D8000 is the most complete in the market. Based on what content you watch this area of the Smart Hub will suggest content you may enjoy based on your viewing habits. Search your TV, any DLNA connected devices and even networked PCs all at the same time. Quickly find the content you are looking for. Built in Wifi is included in the ES8000 and allows for easy connection to the Internet to enable the Smart TV Internet TV options. The built in browser is supposed to allow for quick online search, but that's not exactly what happens. Search is actually very slow due to use of the 5-way control pad for typing on the browser keyboard. Samsung's web browser in the D8000 will search the entire Internet, but it is rather slow to use. Above, we search for our site. The UN60ES8000 is in a unique place value-wise because there are no 60” LED TVs from LG or Sony. The price is around $2999 from most dealers. Sharp has several, their best current offering the LC-60LE847U is around $800 less but is not really their top model (LE945U) as that one has not yet been introduced. Other competition is from the 60” plasma choices out there. Good options for darker rooms. This is probably my # 1 quality choice for a 60” LED for brighter rooms.